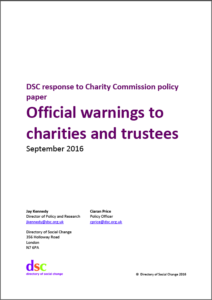 The Charities Act 2016 gives power to the Charity Commission to issue official warnings to trustees. In September 2016 the Commission consulted on how it will use its powers. Before the Charities Act 2016 the Charity Commission had the power to issue statutory warnings to charities but only in the context of an official inquiry. Now the Commission will be able to do this without opening an inquiry, essentially giving the regulator a halfway power between raising their concerns in a non-binding letter, and launching a full statutory inquiry into wrongdoing at a charity. DSC is concerned that this power is open to misuse by the Commission and that there is significant risk of unfair damage to the reputation of charities and the voluntary sector more broadly. Click on the report on the right to read our position.